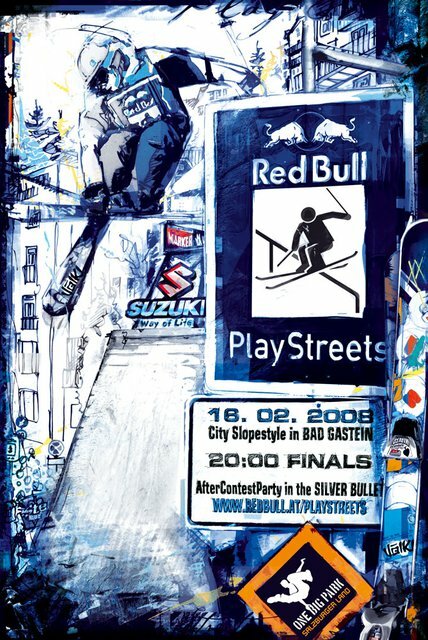 On February 16th, 2008 the world's best new-schoolers will once again gather for the Red Bull Playstreets in Bad Gastein to fire the starting gun for One Big Park. When the first edition of Red Bull Playstreets hit the small spa-town of Bad Gastein in 2007, the air was burning as international top riders wowed more than 5.500 spectators with spectacular rooftop slides, road gap jumps and stylish tricks. This year, the Austrian region of SalzburgerLand once again offers the ideal backdrop for the second edition of the freeskiing event, which not only promises to be even more spectacular than last year, but also coincides with the launch of the youth brand &quot;One Big Park&quot;. The well-tried rules behind the Red Bull Playstreets remain the same: world-class riders shredding right through the town center of Bad Gastein on a breakneck obstacle course and pulling their most outrageous tricks. However, this year organizers have designed an even more challenging setup and shaped additional obstacles. The 2008 route will start with the huge One Big Park Corner, pushing athletes to their limits in the first few minutes. The list of riders willing to take on this challenge reads like a &quot;who's who&quot; of the X-Games. Besides defending champion Charles Gagnier (CAN), Newschool skiing legend JP Auclair (CAN), X-Games winner Simon Dumont (USA) and 15-year-old Frenchman Thomas Krief, who was a surprise third place in 2007, will battle against some formidable opposition. Also lined up among the 13 invited riders are Austrian athletes Tobi Tritscher and wildcard winner Patrick Hollaus, who will prove their skills to impress the expert panel judging their runs on creativity, acrobatics and style. While Friday, February 15 will give the athletes one last chance to practice their skills on the obstacles, the event will start off on February 16 with a tough qualification round at 16.00. The final begins at 20.00 and at 21.30 the big winners can be found celebrating at the fabulous post-event party. One Big Park's communication team will be providing you with text and photography live and direct from the event. All other information on Red Bull Playstreets will be posted on http://www.onebigpark.at. One Big Park is the new youth tourism initiative of the SalzburgerLand Tourimus GmbH presenting young guests countless opportunities for adrenaline-fueled freesports, customized package offers and exciting events like the Red Bull Playstreets. Check out the interactive platform http://www.onebigpark.at for more information and news!